Acknowledged as one of the top commercial sound designers in Canada, Dan is a multi-talented music and audio engineer, location sound recordist, foley artist and designer of audio for television, motion pictures and commercials. He is sought after for his passionate, creative and sensitive approach to sound. Engineers often comment on the high quality of Dan's work, which stands on its own without the support of music and dialogue in many cases. His attention to detail is legendary. 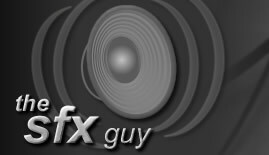 Dan has designed sound effects for various music production houses including David Fleury Music , Grayson Matthews, David Krystal Music, Vapor Music, Steam Films, Eric Harry Music, RMW Music, Tattoo Music, The Hive and The Egg Plant. As a producer, Dan's clients include DCC Communications, MacLaren, Ogilvy & Mather, and Young and Rubicam. at Studio 306, Airwaves Audio and Eastern Sound. In 1982, he started working at Studio 306 full-time and in 1984 he became strictly freelance. From 1985 to 1989, Dan was also producer/partner of a music production company called Hark Productions. This company specialized in original music for commercials and theatrical shows. In 1989, Dan teamed up with veteran music writer/producer David Fleury, and began to design sound effects, foley, and record location sound for David Fleury Music. In 2007 Wanted! Sound Design and Editorial, enlisted Dan as Dialogue Editor for various documentaries and animation shows. And in 2011, he became part of the mixing staff at Wanted. He added teaching to his extensive resumé, lecturing in sound design and audio production at Ryerson University, Radio and Televsion Arts program, Trebas Institute, Metalworks Institute of Sound and Music Production and Fanshawe College in London. Dan is a producer in his own right, and has served as a consultant on the Board of Fanshawe College. Dan has been the sole judge for MIA, Audio for Video Awards, at Fanshawe College from 2006 to 2017.